I've been listening to a lot of podcasts recently, both knitting-related ones on iTunes, and conceptual programmes via Radio 4. One of my favourites is The Gentle Knitter video podcast over on YouTube: Nicole has a charming aesthetic, and the whole podcast is both soothing and textural at once. I also enjoy Kammebornia, a vibrant Swedish video podcast; Pia's work is full of colour and patterns in the countryside - and very unlike my grey-black-white experience of Stockholm! I loved the fact that Pia and Nicole keep their knitting projects in baskets around their houses, including baskets inherited from their mothers and grandmothers. In the past, I've tended to keep my knitting projects in various plastic or calico shopping bags dotted around the place; but I decided that it was time for an upgrade. My grandparents have severe hoarding tendencies, which occasionally proves useful: it didn't take very long to unearth this large wicker basket. After a bit of patching up with PVA wood glue, it was good to go; but I was worried about the rough canes inside snagging my yarn. I decided to sew up some azuma bukuro bags to sit inside. One soon followed another, and I now have three. I made the first bag (above centre, trimmed with navy) out of a scrap of heavy calico. The other two bags are sewn from normal calico used for toiles, and it's much softer: you really need the sizing (stiffening) left in the fabric to make this a successful bag. The pattern is a rectangle which can be divided into three equal squares, so it is rather long and narrow. I wanted to make the most of the scraps of fabric I had as possible, so I decided to forgo French seams and finish the raw edge with bias binding. I used remnants of commercial bias binding from my stash. This is the rather stiff stuff, uncomfortable on a garment but perfect for this use. I squared off the corners so that it sits open with a flat base. I've always been drawn to calico as a material, enjoying the rawness of the cloth. These bags are the right blend of colourful and utilitarian, which is a needed contrast to the extreme colour and pattern elsewhere in my home. Yes, the walls and surfaces really were all white; and all the furniture really was from Ikea. I'm so glad I'm back in colourful and chaotic London! This is a simple drawstring pouch with a buttoned exterior pocket. I used scraps of this wonderful sketchy peacock feather cotton/viscose fabric from Goldhawk Road. Viscose is really too drapey for this kind of thing, so I lined it with robust brown silesia lining, leftover from a tailoring project. Finished with pretty grosgrain ribbon and a vintage button from my stash, this quick project allowed for just the right amount of thinking, as the lining is caught in to the seams (not bagged out). It is now stuffed full of sock yarn. I'm happy to have spent the time pimping up my knitting: keeping works in progress stored in inviting and attractive bags makes me excited to get back into it. I try to stick to one project at a time, with the reasoning that I only have one pair of hands to use and I'd rather have more finished projects than incomplete ones. 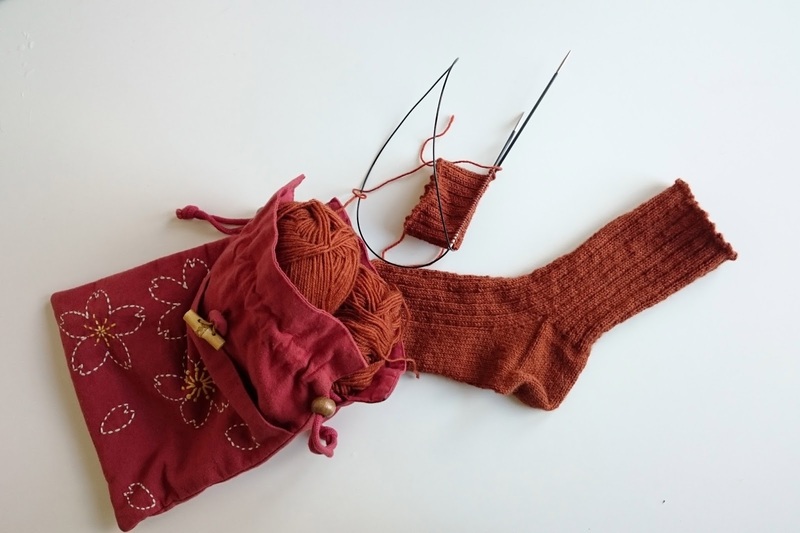 Having small incentives like using beautiful tools and equipment is a great way of keeping up motivation, especially when you're in the tricky stages of a project like knitting the second sock or final sleeve!